Audio Visual hire throughout London and the South East. 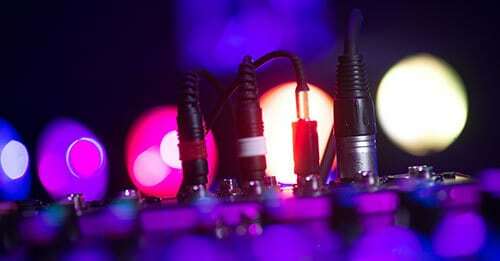 DJ2K provide a friendly and personable service alongside expert advice on all aspects of audio visual hire. We understand that you may have a particular vision or theme in mind for your event, and we are happy to give you the technical expertise in order to achieve it with great success. DJ2K provide equipment and technical support for corporations, weddings, private individuals, event planners, venues and the conferencing industry. We pride ourselves on our professional and expert knowledge of all audio visual hire equipment and can utilise this to assist you. We understand that no two events are ever the same, so we always tailor the equipment and set-up arrangement to each of our clients’ bespoke requirements. Audio Visual hire is an important aspect of any event. 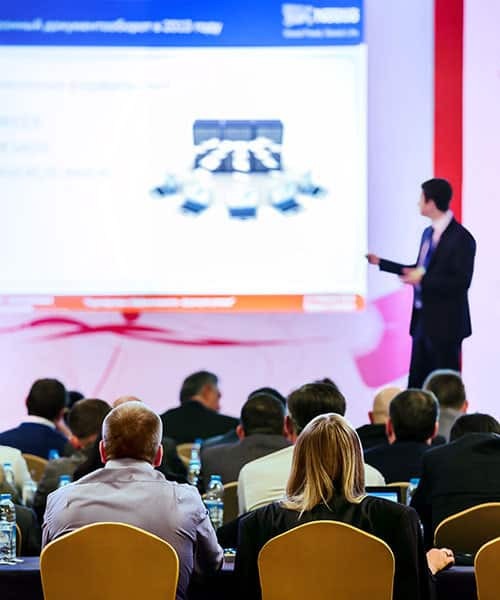 AV equipment can range from presentation visual aids, such as projector and plasma screens, to sound components like microphones and speakers. No matter what type of event you are planning, the detailed touches of our designed-to-impress AV equipment available to hire, will certainly make an impact. Our first point of call will always be to discuss the scale of your event, and go through the various audio visual hire options available. We will obviously need to take into consideration how large or small your event will be. If it is a intimate event, having a small PA system to help deliver any speeches or announcements over background music, may well be a sufficient use of sound equipment. 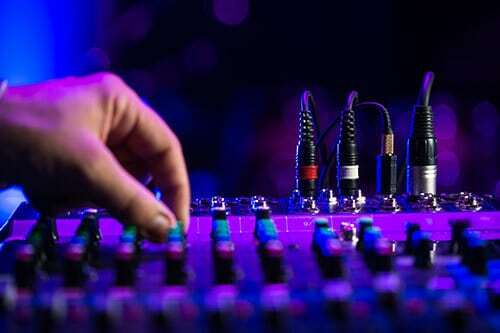 For much larger events, we can go through all the ideas your event organiser has and tailor your audio visual hire options to your specific needs. In most cases we will provide a pre event recce and on-site surveys to ensure the AV equipment will work exactly how you want. As we all know, technology is constantly on the move, changing and improving at a rapid rate. As a forward thinking company we stay up to date on all innovative audio visual products and will always suggest what new technology will work best for your event, ensuring that you receive a cutting edge and dynamic result when it matters most. 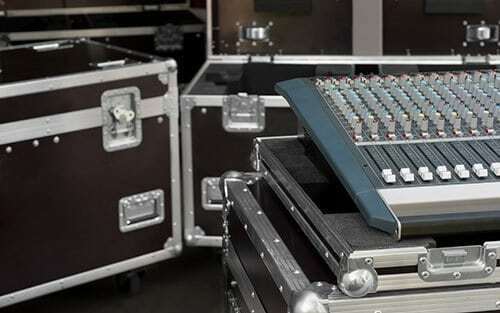 Our audio visual hire service includes set-up, management and removal of all equipment. You do not have to worry about a single thing other than of course enjoying your event. This is just one of the reasons why many of our clients not only use our services on a regular basis but also frequently recommend us to others. At DJ2K we save you time by handling all Health and Safety paperwork. We are fully insured for all locations and our audio visual hire equipment is carefully maintained and PAT compliant. Lighting is a fantastic way to impact the success of a event. It sets the mood and can enhance the experience of all that attend. A large proportion of our clients use lighting to emphasise the branding of their product, bring dramatic attention to certain areas or improve the quality of any photos or video being taken. All you have to know is what effect you would like to have, and we will put together suggestions to give you control over the mood and focus of your event. Control: Sometimes lighting is used to create an ambience, which means the most basic of control is required. On other occasions we have programmed a lighting display to music consisting of advanced moving heads which require professional technical expertise. Position: Lighting can be accommodated on stands, trussing or ceiling anchor points, this is very much venue type dependant. Power: The amount of power required depends on the size of the set-up and is normally only a major factor in larger venues. 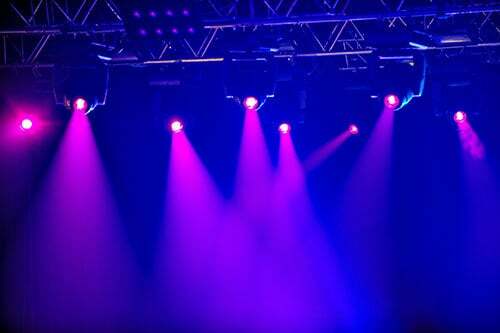 In smaller venues we often use LED lights as these require less power. Type of Lighting: There are a range of lights you could use to suit your event. You could have LED Up lighters which are a firm favourite with many conference organisers, venues and event planners. They deliver a bright light and are easily concealed. With minimal power consumption, these have a longer working life and low heat output (so perhaps a good point for your company green policy). There are many colour combinations and are even effectively visible for day-time events. You could also opt for fixed and zoom lights, which come in a variety of options. Par cans utilise a colour gel or white light, which is great for set-up flexibility. Source fours are normally used to highlight a particular area, such as a lectern, solo performance or first dance. The beam can also be shaped using internal shutters. Follow-spots are the traditional attention seeker for award ceremonies or perhaps theatrical productions. Water resistant architectural lights are the most effective for outdoors used on buildings and trees. Lighting up a historical building with these lights creates a spectacular effect. Bespoke Gobo Projection will allow you to have your custom logo projected in any area you wish, this type of lighting is ideal for product launches to help create brand awareness. Our team of Audio Visual hire experts are dedicated to providing our clients with a professional, efficient and reliable service. Plus our on-site team of uniformed technicians work tirelessly but very much in the background so as not to draw any attention away from any events in which we partake. We work on a vast array of events including; seminars, conferences, live events, graduation ceremonies, fashion shows, award ceremonies, annual general meetings, product launches, weddings, movie openings and much more. At these events we use a range of trusted products and technology which we know are reliable and very effective. Our in-house expert technicians and advisors have worked with audio visual hire equipment for an extensive combined period, so their knowledge on the technical aspects of our industry is vast. We will never offer you equipment which is not appropriately suited for your event. As a company we very much look to go above and beyond all expectations. Lighting equipment is often a very effective way to completely transform a venue, it can also be designed to complement your venue decor assisting in the creation of a stunning or even dramatic atmosphere. Our up lighting can be used to continue your colour theme throughout your entire venue, it will also create ambience for the evening, a unrivalled product in this regard. Projector or plasma screens are visual aids which can help you reach the whole audience when delivering important messages. Video walls are also another way to wow your audience with visual text, branding or imagery. Part of presenting visual material will usually involve a stage, our team can custom make stages with a choice of lecterns, lighting, backdrops and drapery. PA (Public Address) system refers to the relevant microphones, speakers and additional items of equipment which make it possible for the sound at your event to be amplified. In most cases a PA system will consist of a microphone, mixer, amplifier and speakers. The model, style and performance ability of the PA will depend of course on its intended use and the size of the event in question. A common misconception is that a small event does not require any or simply very little amplification, this in fact very much depends the key factors mentioned above. You won’t be surprised to hear that in most cases audiences will pay much greater attention when they can hear every word crisp and clear. There are also occasions where a larger PA system does not necessarily mean that the sound will be louder, but rather it may allow us to achieve better sound distribution in oddly shaped rooms or for larger audiences, meaning the audience at the front don’t get a loud blast of sound for the sake of the audience at the back receiving appropriate levels of volume. Our sound engineers are on hand during events to monitor levels and ensure that at all times they are enhancing the sound quality. To book or find out more about our Audio Visual hire service please don’t hesitate to call DJ2K on 0800 783 2928, or alternatively fill out the form below. Call us on 0800 783 2928 or use our enquiry form below. DJ2K works right across London and the Home Counties including Surrey, Kent, Hampshire, Berkshire and more.